You have a family of seven, with another on the way. You feed your family on the milk from your single cow. As your family grows, that milk is leaving you hungrier and hungrier and you’re starting to dream of thick, juicy steaks. Do you kill the cow and eat well this week, knowing it dooms your family next week? This is a trick question. Of course, you don’t kill the cow. It may hurt now to go without the meat, but there’s a mathematical certainty of doom once the milk stops flowing. It’s really a trick question: the trick answer is, why are you relying on the cow? Why aren’t you and your oldest kids doing some work too? That cow is eventually going to die, leaving you with no food at all, not even milk. We cannot rely on a shrinking tax base of employed—the rich and the middle-class—to pay for the growing population of government workers1, subsidized workers, and an increasingly wealthy underclass. Nor can we start killing them by taking their savings and property to pay for government programs. It might make a tasty steak once, but when that steak is gone there’s nothing to replace it. Who will want to make money (and thus pay their milk in taxes) when even the money they get to keep ends up on the table? Who are you going to sell to when potential buyers know you’ll just take it back when your resources run dry next year? Doom is a mathematical certainty when you kill the cow. In response to The Parable of the Mexican Farmer: Betsey Stevenson’s an example of why it’s so hard to create middle-class jobs, Jared Bernstein. 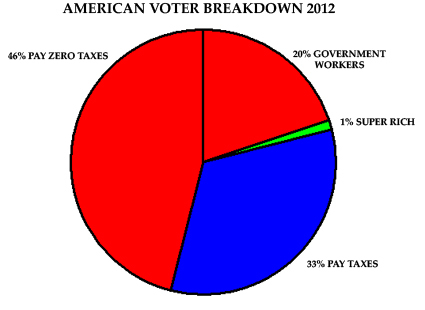 It’s important to remember that for all practical purposes, government workers do not pay taxes. Their salaries come from the money that the government collects as taxes from the private sector. Then they return a fraction of their wages back to the government. But it would make no difference to the government’s finances if, for example, a government worker who pays 30% in taxes were instead to pay no taxes and just have their income reduced by 30%. It would make a huge difference to government finances if private-sector workers paid no taxes. Reducing spending to match revenue is less of an answer than pretending the problem doesn’t exist. The Family Cow last modified March 28th, 2012.